All agents decline an incoming call. All agents miss an incoming call. The maximum waiting time expires. The maximum queue size is reached. When voicemail in Talk is turned off, and when no agents are available to take a call, Talk defaults to your configured voicemail-off greeting, and then disconnects the call. To provide for a better experience for callers, you can add an overflow phone number to each phone number you added to Talk (not including external numbers). When a call is not answered by an agent, and voicemail is off, the calls will be sent to the overflow number. This might be the number of an external support organization, or an on-call agent that you use outside of your normal business-hours, or during holidays. When Talk sends a call to an overflow number that is not a Talk number, a Support ticket is created. This ticket contains the tag, call_overflow. When a call is sent to an overflow number that is a Talk number, a regular ticket with no tag is created. If recording is enabled for that number, any tickets created include a recording of the overflow call. Overflow calls are charged as normal calls, including recordings, when enabled. If you want Talk to always send calls to the overflow number when they cannot be answered, see Adding an overflow number. If you want Talk to send calls to the overflow number depending on the business-hours you have configured, see Adding an overflow number when business-hours are configured. Tip: If voicemail is turned on, you cannot enable the Overflow calls option. Use this procedure to check your call routing settings, and then configure an overflow number. Make sure that the Schedule setting on the Routing tab is set to Always route calls. Click the number you want to edit. On the Overflow tab of the phone number settings, turn on Overflow calls. Enter a valid phone number that calls will be overflowed to. Now, when calls are not answered by an agent, and voicemail is off, calls will be diverted to the overflow number you entered. The procedure to add an overflow number when business hours are configured is different to the standard overflow number. Make sure that the Schedule setting on the Routing tab is set to Business Hours. 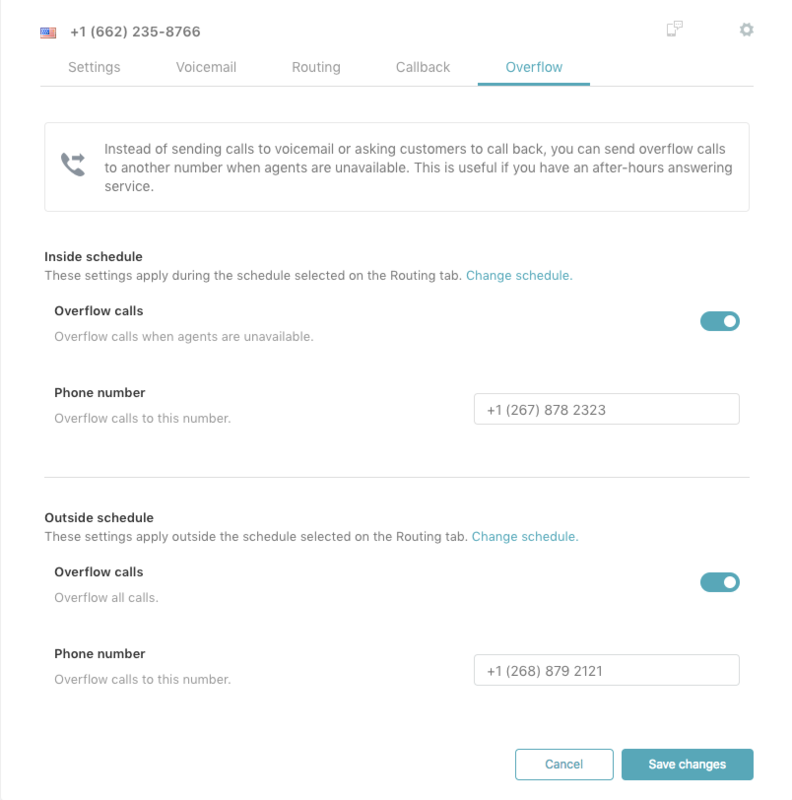 On the Overflow tab of the phone number settings, you can turn on Overflow calls for calls the number receives during the schedule you configured on the Routing tab. Additionally, you can also turn on Overflow calls for calls the number receives outside of the schedule you configured. For each item you configured, enter a valid phone number that calls will be overflowed to. Now, when calls are not answered by an agent, and voicemail is off, calls will be diverted to the overflow numbers you entered, according to the schedule options you configured. I'm on Enterprise and have Talk but don't appear to have these options available. What do? Hi Colin, sorry you are not seeing these options. I've contacted the Talk team, and feel that the best thing to do is to open a ticket, so that your problem can be investigated properly. Hopefully, someone will contact you soon. I really do appreciate having this ability added to Zendesk Talk, since this capability is an integral part of every other phone system, but I now have to choose between two vital services and cannot have both voicemail and after-hours routing. Our customers love being able to leave a voicemail instead of waiting in the queue, and others love being able to use the callback feature, and we would love to be able to cancel our 3rd party IVR that we've been forced to maintain ever since beginning to use Zendesk Talk, but forcing us to turn off the voicemail feature in order to be able to route calls after-hours or utilize overflow routing makes the service completely unusable for us. I love the fact that this new feature brings Zendesk Talk that much closer to parity with other support phone systems, but we would love to be able to use this new feature without having to shut down a critical feature our customers use every day. Hi Bob, thanks so much for leaving this feedback. I'll make sure it's passed on right away. 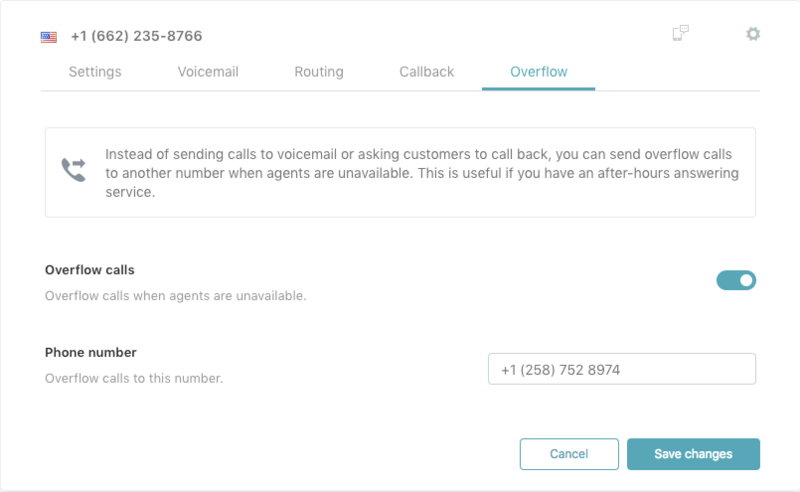 I'd consider having the ability to choose between voicemail and overflow routing (not just having either or) to be a second iteration of this feature functionality, which is something we definitely want to do. Good to know we're thinking along the same paths! Is there the option of an customisable automated message in the event of a service disruption? I.E - can we record a message and have it play prior to the call delivery? Currently there is no system in place to offer a message before it reaches our call routing. We do have options for enabling failover numbers that we outline in the following article. Do I have to have a second group of agents for this to work? What if I used one of our other numbers as the overflow number but it was still routed to the same group of agents? Essentially, this would just increase their wait time and our max queue size. Is that correct? I have a small team and we sometimes max out but our customers would prefer a longer wait time than being disconnected. You won't need to set up a second group on your account for this functionality to work. You'll just want to make sure your voicemail is disabled to use this feature. Once the call is sent to the other Talk number then that numbers max queue and wait time rules should set in. Can I disable Voicemail for Zendesk Talk?